The tilt angle of the solar array is taken into consideration when the system is being designed. The tilt angle in degrees is used when determining the performance of a solar system. If the solar system is being ground mounted or tilted up on a flat roof top the tilt angle is also used to determine the row spacing of the array so the front row of modules will not shade the row of modules behind it. If you are looking at a roof plan for your home or business very rarely will it list the roof pitch in degrees, instead it lists the rise and the run of the roof. For example a 7:12 roof pitch means that for ever 12″ of horizontal distance the roof will increase in height by 7″. 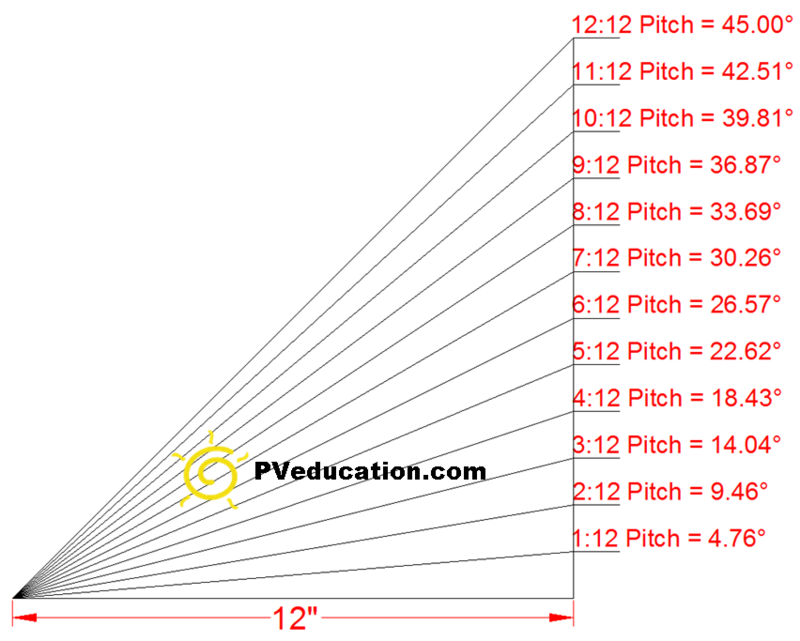 The following diagram will let you easily convert roof pitch to degrees; a 7:12 pitch equals 30.26 degrees.